The CPU (processing): The Central Processing Unit is the brain of a computer system, in charge of executing instructions from its instruction set. A set of instructions in a logic order is what is commonly known as a program. The kernel is responsible for deciding which process get the CPU for executing its instructions. Since one CPU (one core) can only execute instructions from one process at a time, the kernel must assign the CPU to each process for a controlled amount of time. This task is known as scheduling. Memory (memory): The main memory is the place where both instructions and data are allocated before a program can be executed. Since the memory is -once again- a limited resource, the kernel is in charge of allocating and deallocating processes from it so that a given process can execute correctly in a given moment in time. The kernel is also in charge of applying certain strategies to optimize the use of the memory and to determine what should be done in case there is not enough memory for a process to be executed. I/O devices (storage – among others): Devices connected to our machine which carry out a specific task. In the case of embedded systems, the most relevant devices in this matter are the ones related to permanent storage, normally -in this context- a flash device. If we widen our view of an I/O device, we can add almost anything that is not considered CPU or Memory: Display, mouse, keyboard, printer, network adapters, etc. The kernel is in charge of handling requests from applications to perform I/Os to an appropriate device and providing convenient methods for using that device. The Kernel, mostly associated to Linux and Unix-like OS is released under the GNU General Public License, and thereby free software that can be used and modified for non-commercial purposes. In a Linux based OS, the kernel can be changed -under some constrains (e.g. Android 4.1.c Jelly Bean is based on the Linux kernel 3.1.10)- and also re-compiled in order to add new features. As explained before, the kernel is the closest piece of software to the hardware, implying that it has to “know” every piece of hardware in the device it is running on. Where we want to get here is: The kernel must be compiled specifically for the architecture and device it will be running on top of. Since we are dealing with devices such as tablets, phones, boards,etc. we need to cross-compile the kernel in a host machine and transfer it to the device in question afterwards. Here we are going to comment the technical aspects of this process, taking as a example the hardkernel’s ODROID-PC (Samsung’s Exynos 4) developer board. After this, we are ready to actually compile (cross-compile) the kernel. First we initialize object, config, etc. and clean previous attempts of compilation. 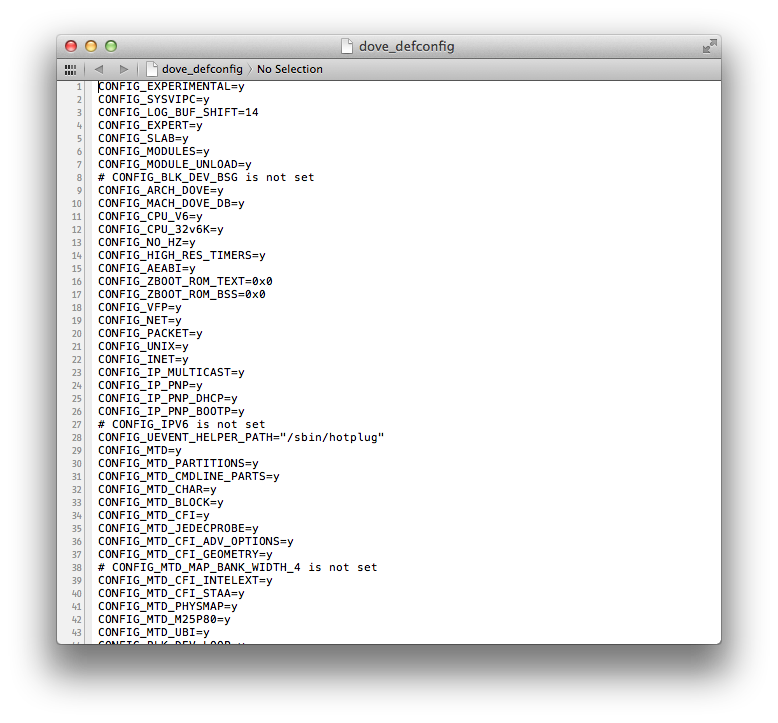 Once the the .config file is created, we can compile the kernel. Please note that this process can take some time (up to several minutes) depending on your hardware. 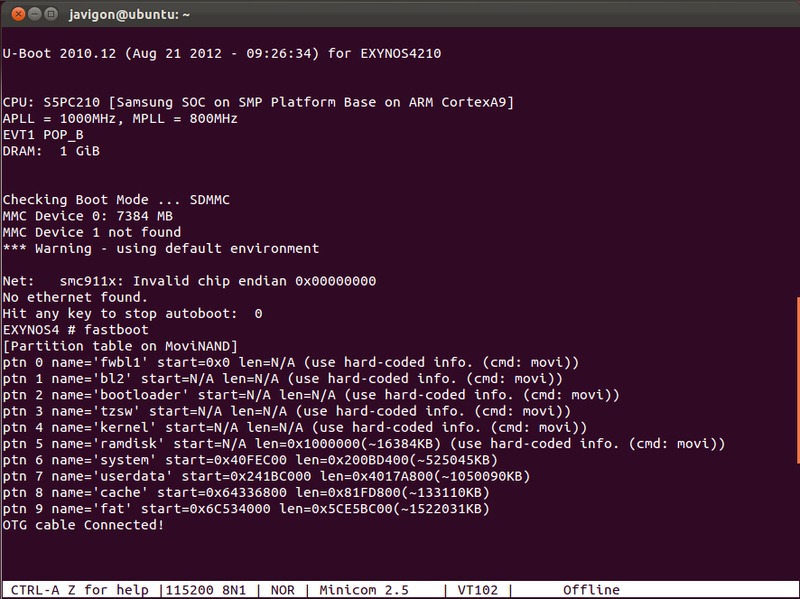 Once the kernel is done compiling, the zImage of the kernel is ready and we can flash it in our device. For this, we are going to make use of fastboot, a command that will help us in the process. Refer to this post about fastboot if you are not familiar with it. (Please note that you should count on a device with a boot loader flashed on it in order to continue from this moment on. Refer to this tutorial to build and flash a boot loader in your board). We connect our device to our host machine and open minicom -or any other serial terminal such us cutecom, screen, etc- (how to configure a serial terminal here – coming soon), turn on our device and press any key to interrupt the boot sequence. We will get a command terminal we can use to carry out simple -but very useful- actions. Type fastboot and connect your OTG cable to both your host machine and your device. From our host machine, we can check that the OTG cable is connected. This entry was posted in Android System Development, Embedded Systems, Linux and tagged Android Development, Android System Development, Embedded Systems, Kernel. Bookmark the permalink.